We’d love your help. Let us know what’s wrong with this preview of Presumed Puzzled by Parnell Hall. The Puzzle Lady gets more than she bargained for when she’s hired to track down Paula Martindale’s straying husband. She finds him, all right—hacked to pieces on his living room rug, while his blood-drenched wife haunts the crime scene clutching a butcher knife. 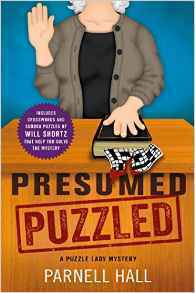 To ask other readers questions about Presumed Puzzled, please sign up. Is it okay that I haven't read ANY other puzzle lady books? Can I still read this? As usual.....a series like this starts to become predictable...and less interesting. Roger Martindale is missing, and his wife, Pamela, has received a crossword puzzle. That evening, he returns home only to be hacked to death. Chief Harper thinks that Pamela did it since she was found with the bloody knife in her hand, but the twists for Puzzle Lady Cora Felton are just beginning. And twists there are. Yes, Cora is right in the thick of things, and as the book progresses she gets even more involved. The characters are a little thin, but they usually are in this series. The real s Roger Martindale is missing, and his wife, Pamela, has received a crossword puzzle. That evening, he returns home only to be hacked to death. Chief Harper thinks that Pamela did it since she was found with the bloody knife in her hand, but the twists for Puzzle Lady Cora Felton are just beginning. And twists there are. Yes, Cora is right in the thick of things, and as the book progresses she gets even more involved. The characters are a little thin, but they usually are in this series. The real star here is the verbal battles the characters have, which are fun and funny as always. The quick wit and the banter made me laugh several times before we reached the logical conclusions. Here's a conversation between Puzzle Lady Cora and attorney Becky. [Becky] "Why would the killer to frame you?" [Cora] "I have no idea." "So think it out. What does framing you accomplish?" "Absolutely nothing. Except it draws attention away from the murder." "The one you're being tried for?" "Yeah, murder. I didn't do that one, either, in case you're asking." "You never said I . Okay, why did the killer need to frame me? He didn't. So why did he do it? Maybe he didn't. If he do Here's a conversation between Puzzle Lady Cora and attorney Becky. "You never said I . Okay, why did the killer need to frame me? He didn't. So why did he do it? Maybe he didn't. If he do it to frame me, then why did he do it? I have no idea, but take as a premise...."
A reader needs to be in the mood for such circular conversations. The usual wackiness and wordplay. Recommends it for: Hall fans. Puzzle lady fans, Puzzle fans. Since I love crossword puzzles, I thought this book had an interesting concept. It does, but not enough to carry the plot. It was a fun read, but I won’t read more in this series. Perhaps if I had started with the first in the series I would be interested in continuing. Never mind. The story was too convoluted and the protagonist appeared to perjure herself (but I wasn't sure because of the convolution), so the reality factor went out the door. A real page turner with lots of twists and turns and lots of mystery and action to the very end of the book. Each one of the books of this series seems to be a little less enjoyable to read. During conversations, it's hard to keep up with who is saying what. And I don't think Cora is a very likable person. One part that i thought was dumb was when Cora's niece picked up her daughter from day care & put her in the car with no carseat & in the FRONT seat. I don't know about where they live, but you sure couldn't get by with where I live. Not that I would want to endanger a child if that airbag wou Each one of the books of this series seems to be a little less enjoyable to read. During conversations, it's hard to keep up with who is saying what. And I don't think Cora is a very likable person. One part that i thought was dumb was when Cora's niece picked up her daughter from day care & put her in the car with no carseat & in the FRONT seat. I don't know about where they live, but you sure couldn't get by with where I live. Not that I would want to endanger a child if that airbag would explode. Huh. I thought I had been keeping up on the Puzzle Lady books but my library is lagging seriously behind. When I got this ARC, I was surprised to see how much time had passed. But that didn't affect my enjoyment of the book. Becky , the local lawyer is having trouble finding a client so she asks Cora for help. When Cora finally finds a client, it doesn't go well. Paula Martindale is found over her husband's dead body with a knife in her hand. And she doesn't want to let Becky do her job. The prob Huh. I thought I had been keeping up on the Puzzle Lady books but my library is lagging seriously behind. When I got this ARC, I was surprised to see how much time had passed. But that didn't affect my enjoyment of the book. Becky , the local lawyer is having trouble finding a client so she asks Cora for help. When Cora finally finds a client, it doesn't go well. Paula Martindale is found over her husband's dead body with a knife in her hand. And she doesn't want to let Becky do her job. The problem with this case is that the more they clear Paula's name, the more it seems that Cora may be the killer. I love The Puzzle Lady. It was a little weird, though, because she has quit smoking and didn't whip out her gun and threaten to shoot anyone...but still, a great plot, lots of crazy twists and turns, and lots of Cora!